Addressing climate change can be an overwhelming and daunting task, but when all individuals in a community engage, prepare, and collaborate on effective climate change strategies, partnerships and solutions arise. Evaluating baseline opinions, values, core beliefs, and identities of a community’s diverse population will allow environmental health professionals to better understand how and where behavior change can produce maximum results. Promoting long-term planning for climate change is important. Communities must create and be examples of more efficient and sustainable lifestyles, such as using active and mass transportation, reducing waste, and conserving energy and water. The National Environmental Health Association (NEHA), in partnership with the ecoAmerica's Climate for Health, published survey results in the Journal of Environmental Health from three annual surveys that measure NEHA members' attitudes, awareness, and behaviors towards climate change. The results of these surveys better inform actions that Environmental Health professionals can take to adapt and prepare for climate change impacts in their local communities. As part of NEHA's partnership with Climate for Health, we are addressing climate change through clean energy solutions. NEHA's Board of Directors approved a declaration on 100% clean energy by 2030. Carbon pollution is warming our planet and profoundly affecting the U.S. and the world. U.S. leadership can help the world meet these challenges with innovative solutions. We have an obligation to act today on climate change and build a sustainable future for our children, so we must start with mitigating our own climate impact. Therefore, NEHA is committed to work towards 100% clean energy use by 2030. We will employ administrative, educational, engineering, and fiscal measures to meet this goal. NEHA's President's Column: The Impacts of Climate Change Are at Our Doorstep! Please see NEHA's President's column in its November 2018 Journal of Environmental Health, The Impacts of Climate Change Are at Our Doorstop. The column stresses the need for the environmental health profession to address the impacts of climate change on our work in areas such as air, water, vector control, food, safety, and the built environment. NEHA's Board of Directors adopted NEHA's Climate Change Policy Statement written by NEHA's Climate Change Committee. Climate change is affecting environmental health—the quality of air, food, and water in the communities where we live, work, and play (Centers for Disease Control and Prevention). NEHA recognizes climate change as a world-wide environmental health problem that has health and safety impacts to individuals and communities. Environmental health professionals improve and protect the public’s health and create and sustain healthy communities. It is NEHA’s responsibility to support the capacity of environmental health professionals to address the health impacts of climate change with risk assessment, adaptation, and mitigation planning. NEHA is excited to partner with ecoAmerica’s Climate for Health program. Please see Climate for Health's resources and recent climate reports. Together, NEHA and Climate for Health are building visible national leadership on climate solutions and institutionalizing climate action as a health imperative; developing and supporting climate literate environmental health professionals that can lead on climate; engaging all leadership, members, and stakeholders; and building collective support and action for climate solutions within the NEHA community and across the health sector. ecoAmerica’s Climate for Health program partners with America’s leading health associations and institutions to make climate change a top national health priority. NEHA, in partnership with ecoAmerica, Climate for Health, has developed a five-minute video featuring NEHA members’ success stories addressing climate change impacts from Cambridge, Massachusetts; Salt Lake County, Utah; and Franklin County, Ohio. Environmental health professionals and members of NEHA’s Climate Change Committee share their inspiring stories addressing strategies for adaptation, mitigation at the community level, and strong coalitions and collaborations. The National Climate Assessment is a congressional-mandated report released about every four years on what climate change means for the U.S. The report is produced by federal agencies comprising the U.S. Global Change Research Program, a presidential initiative started by President Ronald Reagan and mandated by Congress in the Global Change Research Act of 1990. The findings consolidate key messages and supporting evidence from 16 national-level topic chapters, ten regional chapters, and two chapters that focus on mitigation and adaptation response strategies. As part of its partnership with ecoAmerica’s Climate for Health, NEHA is contributing blogs on climate change. December 2018: NEHA’s Declaration on 100% Clean Energy by 2030 written by NEHA Staff. 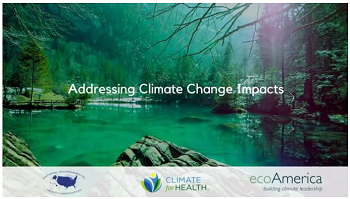 October 2018: NEHA and Climate for Health Release New Video Addressing Climate Change Impacts & Solutions written by NEHA Staff and members of NEHA's Climate Change Committee. August 2018: Climate Change and the Built Environment: It’s Time to Make Changes written by Felix I. Zemel, MCP, MPH, DrPHc, Co-Chair of NEHA's Climate Change Committee. June 2018: Humans Have a Right to Clean Air and a Healthy Climate written by Richard Valentine, NEHA’s Climate Change Technical Advisor and Chair of its Climate Change Committee. May 2018: NEHA Members’ Climate and Health Awareness: Challenges, Growth, and Solutions written by NEHA staff. The blog is written based on NEHA's Climate Metrics Survey results report in partnership with ecoAmerica and Climate for Health. February 2018: Honoring Our Heritage, Leaving a Legacy: Environmental Health and Climate Change written by NEHA's Climate Change Committee member, Richard Hicks. Please see other related climate change blogs. Please see NEHA's Climate Metrics Survey results report (2017) in partnership with ecoAmerica and Climate for Health. NEHA invited its members to participate in an online survey to determine members’ attitudes and behaviors on climate change. This survey was part of a national survey sponsored by ecoAmerica and Climate for Health. The report highlights key NEHA member results and comparisons to a representative national sample of U.S. adults, and a sample of NEHA members in 2016. NEHA program committees provide guidance, input and expertise to NEHA leadership and program staff, fellow environmental health professionals and partner organizations on environmental health policies and programs. The Climate Change Committee Mission, Goals, and its Members are listed here. For more NEHA and additional resources, click here.